Kids facing the college years are intimidated by the looming challenge with the possibility of an uncertain payoff and insurmountable student debt. 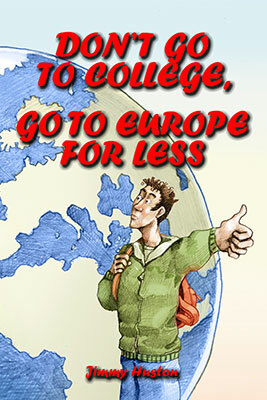 This humorous book offers an entertaining alternative -- investing college tuition money in years of independent study abroad. 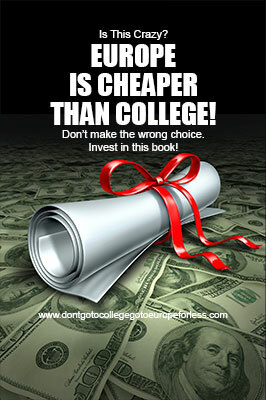 The lighthearted approach presents an alternative to a college education with a promising series of options. What seems like a wild proposal is given a semi-serious argument in its support. Dropouts will be exposed to academic subjects, but as extended independent study rather than in a classroom setting, with emphasis on subjects such as language, world history, political science, literature, the arts, etc. Inspiring, with information on many accomplished and successful dropouts, from Herman Melville to Steve Jobs. Jimmy Huston grew up on college campuses where his father was first a graduate student, then later a college professor. He occasionally attended college himself, somehow managing to graduate, and has forced two daughters to attend college. He has even taught college. And, he believes that college is a crock.